Elizabeth and I spent a week in Maine during Hurricane Irene last year. 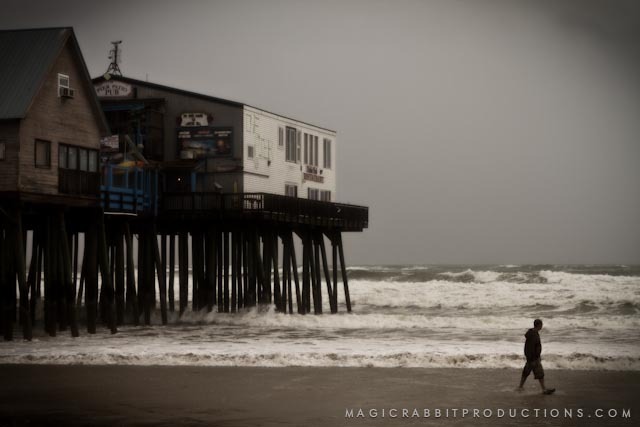 As the storm assaulted the coast, we holed up in our beach front cabin, doing our best to stay warm and dry. During a lulls in the rain, we would race outside to document the weather and the desolation, before being driven back to safety. I’ve had this cut for a long time and haven’t done much with it. I’ve been concerned that it’s non – narrative and nothing more than a collection of shots and songs that are boring to anyone but me. But that’s not enough to stop me anymore. Ever since I’ve started taking on more clients, I’ve actually become more invested in personal projects. I find that I NEED to do things for myself, simply because I want to explore the medium for me. * As a side technical note: this is the last piece I shot predominantly in 60p. Slow motion is awesome, but on a DSLR the morié gets so bad it’s almost inexcusable.